Above: Some of the 16,000 vacant houses in Baltimore. These are on Guilford Avenue, not far from the city schools headquarters on North Avenue. 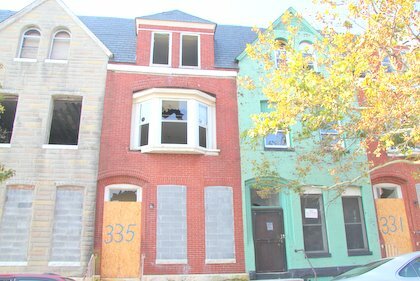 Mayor Stephanie Rawlings-Blake took aim at blight in Baltimore today with a 6-point plan intended to speed up the sale, redevelopment and, in some cases, demolition of vacant properties, including thousands of city-owned parcels. A major part of her plan involves strategies for streamlining the sale of vacant properties and getting them “into the hands of those both willing and able to renovate and invest,” as Rawlings-Blake put it. * Streamlining the process of selling city-owned vacant properties. Some of the mechanisms Rawlings-Blake proposed here were controversial when they came up for a vote today at the city Board of Estimates. A provision that would allow officials to auction off city-owned properties without setting a minimum bid drew criticism from City Council President Bernard C. “Jack” Young and City Comptroller Joan Pratt, but the spending board approved the measures anyway, according to The Baltimore Sun. * Using code enforcement attorneys to spur investment in 700 vacant buildings in “emerging markets near areas of strength.” In these areas, the City “will work in partnership with committed and capitalized developers to leverage reinvestment, block by block, without major taxpayer subsidies,” Rawlings-Blake said. * Creating incentives for homeowners and developers who renovate vacant properties, including an allocation of $500 thousand to a new incentive called the Good Neighbors Program, which provides a $5,000 five-year forgivable loan for 100 City Police Officers, Firefighters, and Teachers who purchase a vacant property in Baltimore. * In distressed areas, continuing to support large-scale redevelopment projects, such as Uplands, Poppleton, Barclay, she said.